Get in touch with our friendly 24/7 customer care assistance to get a totally free price estimate straight away. Just call 020 3746 3201 or send an online request. We are a qualified cleansing provider in London and our company has proven cleansing techniques to be highly efficient. All of them are environmentally friendly and safe for your clients and you. We use Prochem cleaning detergents and all of our technicians are covered by insurance. They will take care of everything in your business space. Our professional cleaning company is specialised in deep retail and restaurant cleaning, in accordance to all safety and health methods. We have many years of expertise in cleaning of local restaurants, eateries, shops, malls, supermarkets, department stores and public buildings. We can supply you with same day emergency cleaning service , or can come on any day of the year, after working hrs, so as not to interrupt your employees and customers. 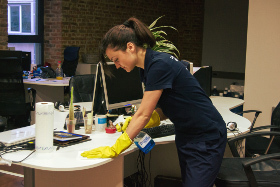 Contact our customer care centre to request an appointment for our office cleaning services Balham SW12 24/7. You can do that by calling our 020 3746 3201 or sending an online request. We offer excellent, fully insured, cost-effective business cleaning services. We offer favourable regular cleaning contracts for local companies. Book now and let us professionally clean your office today!